Our original church building was constructed in 1957 and has been added onto three times since. The original building was designed by architect John N. Richards, a prominent Toledo architect of the firm Bellman, Gillette, and Richards. The original building consisted of the Nave, an Office Area, a Fellowship Hall/ Sunday School area, and a basement with a meeting room and boiler room. Classrooms, a kitchen, and a nursery were added and the basement was expanded in 1959. A large meeting room, The Commons was added in 1974 designed by parishioner architect Daryl Blanchard. A major $1,800,000 building project was completed in 2002, designed by Stough and Stough architects. 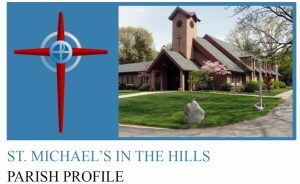 This project added a Narthex with steeple, a new Fellowship Hall and kitchen, a new choir room, new offices, ADA restrooms, and converted the old fellowship hall to a youth education area. Our facility is designed to be welcoming for all. All building entrances are on grade with long easy ramps integral to the site. The main entrances to the building havewide, powered doors, The basement access is by stairs only. Following a recent update, all restrooms in the building are ADA compliant. Fellowship Hall has ADA toilet rooms. Signage has been added recently with Braille features. Various corridors provide good circulation routes. The Nave is a 100 ft long and 41 ft wide structure of brick construction with a high pitched roof with exposed wood bents and wood decking, and stained glass windows in dormers along each side. The congregation seating is cathedral chairs which are moveable, seating about 220 people. Choir seating adds 30 seats also moveable and there are about 20 seats available along the sides of the Altar for service participants. Normal seating then is 270 seats and with overflow seating would be a total of 314 seats. The Nave has been recently enhanced by a new sound system and a new lighting system. The sound system has a main speaker mounted high and supplemental speakers for the choir and Narthex. There are 4 wireless receivers, 6 wired mike locations, hearing impaired receivers, CD and MP4 players, and an SD card based recorder. The lighting system has LED lights arranged in 9 zones with a solid state programmable dimming system. The Fellowship Hall is the primary meeting area of the church. Coffee Hour and Common Grounds are held here on Sundays from September through May. An audio visual system with automatic screen and ceiling mounted projector was recently installed. The adjoining kitchen includes a cook top with exhaust hood, a double oven, two warming ovens, a big work island, numerous cupboards, 3 sinks, a small commercial refrigerator, and a small commercial dishwasher. The Fellowship Hall is air-conditioned and serves as a retreat from the Nave during periods of extreme heat in the summer. The Commons Area houses the church library with meeting tables along with two couches for quiet conversation. It has picture windows and a sliding door with access to the Saint Francis Courtyard and its benches. The parish library is housed in this area. Occupying about 5,000 square feet, the youth education area has 6 classrooms, a youth choir room, a large high school room, a nursery, a common space, and the office of the director of youth ministry. The office area includes two Rector offices, a conference room, a treasurers room, and a general office area. Wi-fi is available in both the office area and the fellowship hall. The choir room includes a climate-controlled rehearsal space with a rehearsal piano. The room is used periodically for other meetings when the choir is not rehearsing. There is an associated large corridor/gallery along the front of the church, and a small garden courtyard in that area.